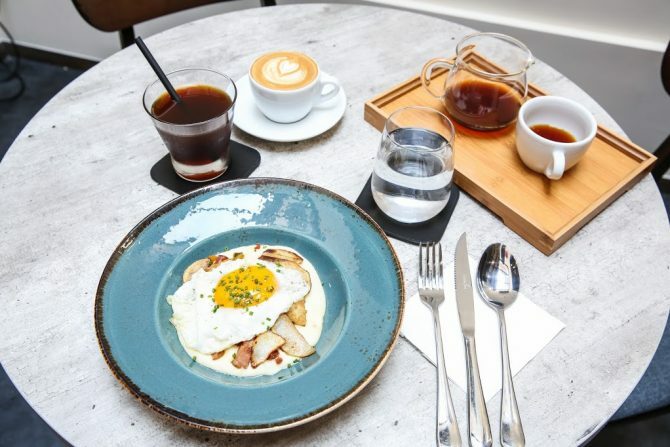 Located along Jiak Chuan Road mere steps away from its trendier neighbour Keong Saik, .elia lures with not only a charming setting of wooden-chic decor, but also its curated menu of comforting, cafe food. During the day, natural sunlight fills the 30-seater bistro that occupies the lower floor of a beautiful Peranakan-inspired shophouse, before transforming into a casual restaurant by night with its lunch and brunch offerings swapped out for a refined dinner menu. While most of the dishes here are not entirely new to the culinary realm, owner-chef Clint Seah has placed his own unique twist that reflects his travels, inspiration and personal journey. Another thing to note is that all the breads and pasta are freshly made. How’s that for honest cafe grub? Carb lovers unite! The restaurant serves up an unapologetic potato-brimming dish called Potatoes. Topped with a glorious sunny side up, the carb-laden dish features a delectable combination of truffle mashed potatoes, roasted potatoes, and crispy bacon. We found ourselves making a beeline for the mashed potatoes that was addictively creamy and flavourful with its truffle.